Have you always wanted to see the modern 7 wonders of the world? Well, we all think you should but before you get your visas sorted, check off the 7 wonders that are less than 8 hours of travel from Bangalore. From beautiful statues to the palaces, here’s own magnificent seven! Set on two hills, this beautifully sculpted town filled with temples and statues dedicated to the Jain community. Atop the Vidhyagiri hill is the world famous monolithic statue, standing at a whopping 40 feet, of a fully undressed Gomateshwara or Bahubali. While it is a pilgrimage for the religious, climb over 700 steps to see this looming statue, even if you’re an adventurist. Once in 12 years, the statue is bathed in turmeric, honey and milk, and it’s rather a majestic sight, we’re told. Just three-hours away from Bangalore, Mysore usually isn’t on most people “Must-Visit” list. But it’s changing, and how! Apart from the parks and the zoo, you’ve got to check out the grand Mysore Palace! With a view of Chamundi Hills and sprawling gardens, head here for that touch of royalty. You can glide through the halls, intricately painted corridors, and hand-crafted columns supporting the gorgeous roofs of the durbars. Or pose next to the elegantly styled boudoir fit for kings, queens and princesses... it’s a page right out of a fairy tale. Home of the Hoysala dynasty the twin cities of Belur-Halebidu always go together, thanks to their marvelous architecture. 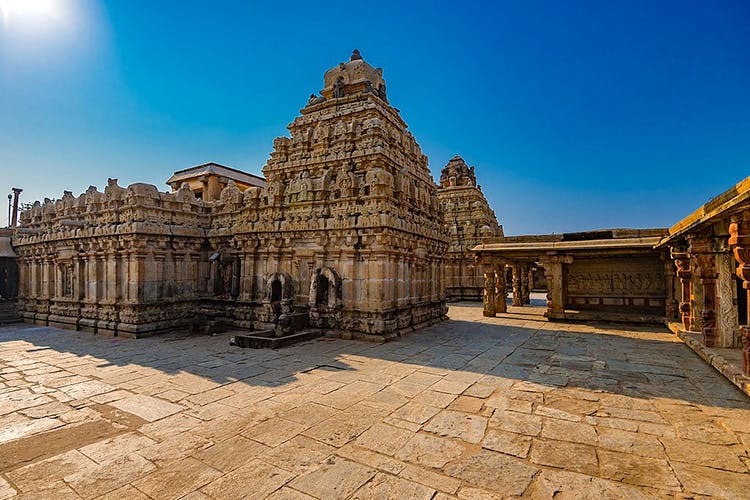 The Chennakeshva temple in Belur built in the 14th century has intricate carvings, sculptures and statues to hawk at, while just 16 kilometres away at Halibedu, the Shantaleshwara temples will leave you breathless. Apparently around since the 12th Centure, this temple has even more intricate sculptures with expressive eyes and body language. Don’t miss out on seeing the sculpture of Shivatandavam (Shiva’s dance) with every muscle of Shiva being etched to perfection. If you are a fan of forts with high walls, watchtowers, bastions, moats and secret escape routes, think no further than Mirjan Fort. Just 45 minutes away from your the beaches of Gokarna, it has seen a lot of battles and changed hands between the Tuluvas to Sultans and finally the British in 1784. This place has been at the helm of the Pepper trading business initially started by one of the bravest queens, Chennabhairava Devi. Standing on top of the fort will transport you back to the olden days where soldiers guarded and fought the harshest of battles to protect their kings and queens. Needless to say, it’s slippery in the monsoon, but the ruins get covered in green moss, making it look quite mystical. If you get to the top-most bastion, you’ll even see the spot where the river Souparnika meets the Arabian Sea. Spread across three acres, this 400-year-old natural marvel makes it seem like there are 100 trees at the spot. There is a whole eco-system of birds, squirrels, dogs and monkeys; you have to be careful to not eat while exploring the place else your snack might end up with the monkey! Just 28 Km from Bangalore this place has to be definitely added to your list of places to visit! If you have kids, then make sure to take a picnic, but away from the monkeys! We also suggest taking a few games like Twister and perhaps even cricket and frisbee to soak in the outdoors. A disappearing church you say? Built by French missionaries for the wealthy British aristocrats, this “Floating Church” is definitely not to be missed. Just four hours from Bangalore, during the monsoon months of July to October, due to rise in the water level in the reservoir, the church submerges. That of course, lends it a magical and almost mystical look. You can even see the clear reflection on the waters. But come winter, the church rises (in true Christian glory), and despite its worn out facade, the place is worth a visit to see its gothic architecture.